There are pivotal points in every remote business venture that determine the direction or even the viability of the project. Specialist crews work onsite for several days or weeks conducting tests that generate vast amounts of data. The cost for these services is significant. In the case of a drilling program, rig fees often run a million dollars a day. In order to reap maximum benefit from your investment and direct the field activity as it takes place, you need to be able to see and analyze the data while the crews are onsite. Infosat spares you from having to camp out at the project site by providing access to the crucial field data in real time, on your own computer. We make it possible for you to see all that’s going on in the doghouse without leaving your office. Our Nomad Operations solution is designed for these short term, data intensive assignments. It equips service firms to do their work virtually anywhere and transmit large data files to downtown offices. The equipment is rugged and quick to set up. At the push of a button the hydraulically controlled satellite dish emerges from its secure transport enclosure. Most systems feature automatic signal calibration for fast connection to the Infosat network. 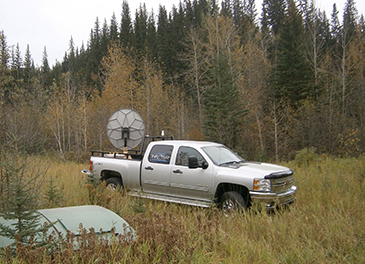 Infosat operates Canada’s highest capacity satellite network to give you access to all the bandwidth you need – even if the assignments only require a few day’s worth of service. What Remote Services Do You Need to Support? What services do you need to connect to in remote locations? How data intensive are these operations? What type of trucks and other equipment is onsite?